What’s the best food for German Shepherds? Something that keeps that motor running, so they can work off all that energy, of course! This breed loves to work, and they love to think. So they need a food that’ll help keep them sharp and healthy for a long time. And choosing food like that is not the easiest task. Lately we've been consulting with a few of our resident dog experts to help you find some food options that’ll keep your dog lively and healthy. Check it out! 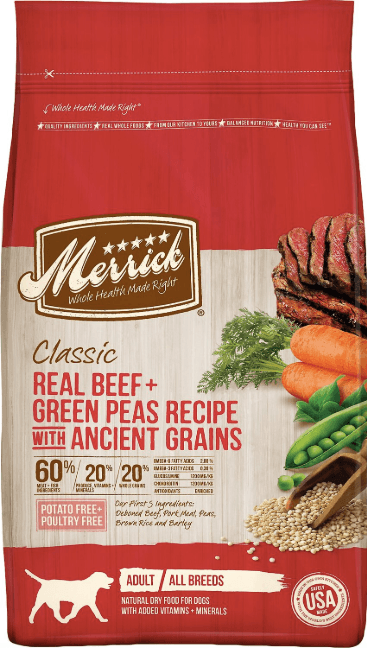 I love Merrick, so I have no problem recommending their real beef formula. One of the things I like, especially for a big, active dog like a German Shepherd, is the high protein content (about 60%). Most of those calories come from the main ingredient: deboned beef. The remaining 40% of this recipe is split right down the middle: half comes from fresh produce, and the other half comes from whole grains. The veggies include carrots, apples, blueberries and alfalfa. The whole grains include barley and brown rice (so skip this one if you’re avoiding rice altogether). All in all, this is another good option from Merrick. The only reason I wouldn’t consider it #1 is that it includes small amounts of fish and rice (but not much). This is a brand I’ve been meaning to try for a long time. They take a lot of pride in the quality of their ingredients, which is something that I really like to see in any dog food brand. For example, they include absolutely nothing that could be remotely harmful for a dog: grains, potatoes, preservatives, salt, sugar, coloring, etc. You won’t find any of it. 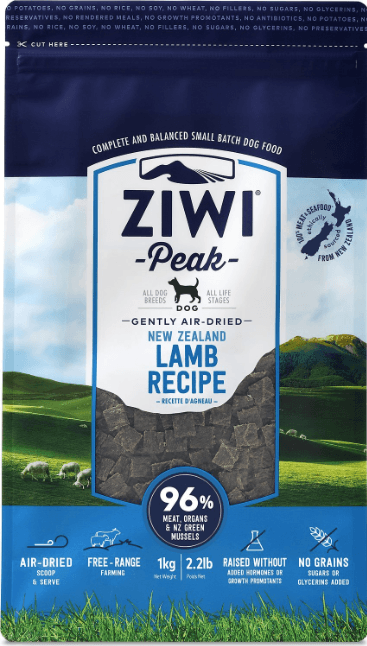 The lamb here is 100% grass-fed and raised in real pastures, which is great for ethnically conscious German Shepherd owners, which can make it much easier to handle for dogs with allergies (we didn’t list this above, but some German Shepherds can be prone to allergies). The one downside here is that, while it contains some nice leafy greens (kelp and parsley), it doesn’t contain much other produce, which, in our opinion, makes the nutritional profile a little 2-dimensinoal. Still, the quality of ingredients here is really great. Just looking at a nutrition label this short is refreshing, really. We recommend it. The Honest Kitchen has a really good line of dehydrated dog foods. It’s a just-add-water kind of thing. 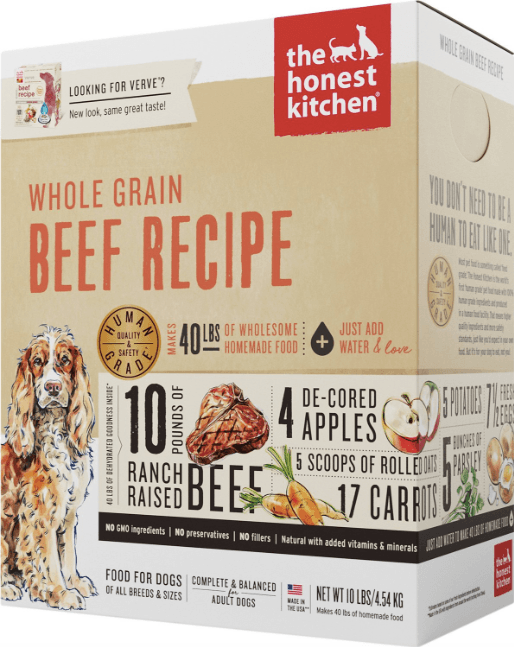 What I really, really like about The Honest Kitchen’s stuff is that everything they put in their dog food is human-quality food. That is really hard to find unless you’re making your own dog food—trust me. Another good thing about this formula is that almost everything is organic, and every ingredient is hormone free. There real reason we listed this first is the absolutely fantastic selection of leafy greens and other veggies. You’ve got chard. You’ve got parsley. You’ve got sweet potatoes. It’s just a super well-balanced dog food. The only thing I was worried about was taste. I remember tasting dehydrated space food once at the Smithsonian, and it was super weird. Our dog didn’t seem to mind, though. She snarfed it hard. The above calories estimates are based on a 70-pound dog. That’s roughly an average weight for both a male and female dog of this breed. Of course, it’s a bit higher than average for a girl, and a bit lower than average for a guy, but for simplicity’s sake we went with a nice, round number. The amount of energy your dog expends (and therefore the amount of food he needs to consume) depends on a bunch of different things: how old he is, how fast his metabolism is, and how much exercise he gets every day. So just make sure you visit a veterinarian to get a more accurate measurement of how many calories your specific dog needs on a daily basis. For an average German Shepherd, though, you can expect to feed him about 1,600 calories per day. If he’s an older dog (or if his energy dropped significantly after being neutered), he’ll eat more in the range of 1,200 calories. On the opposite end of the spectrum, though, highly active or working dogs need somewhere around 2,100 calories per day. Remember, these are just estimates. Consult your vet! There’s a really cool and interesting book I saw on the HappyDogTraining blog called Canine Nutrition & Choosing The Best Food For Your Breed Of Dog by William D. Cusick. We always avoid soy, but we almost never avoid fish. This is one of the few circumstances in which you may want to opt for different sources of fats, such as flaxseed and avocado. Likewise, German Shepherds do really well with a diet rich in beef and leafy greens. They also tend to do well with wheat-based carbohydrates and other grains, so don’t be afraid to embrace foods like barley and oats. 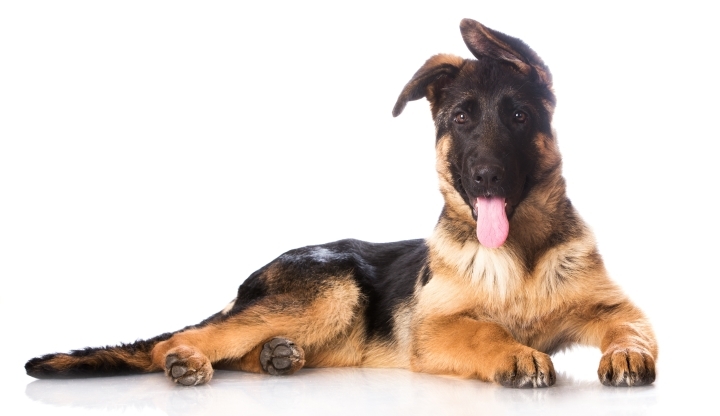 One of the German Shepherd’s unique (or gross) little quirks is that they tend to have shorter colons than other dogs of similar sizes. Because of this, it can be tough for these guys to properly absorb all the nutrients they need to from their food. One way to help them do that is to feed them lots of fiber. The good news is that you can get fiber from tons of great sources, like oats and barley (like we mentioned above), or from fibrous produce, like leafy greens and apples. Bloat, or gastric torsion, is a really scary thing that sometimes happens to big dogs who like to play after eating. Long story short, a dog’s stomach can twist around and stop letting gasses escape, which, if not treated immediately, can even be fatal. The beset things you can do for your dog if you’re concerned about bloat are to (1) break his daily food ration into smaller, more frequent meals and (2) make sure he relaxes for about an hour after each meal. Lots of bigger dogs have hip trouble, and German Shepherds can be counted in that group. It’s really tough to totally prevent hip and joint problems, since this breed is so active, but there are a few things you can do to promote general joint health. Mostly, you want to look for sources of glucosamine and chondroitin in your dog foods. This helps keeps your dog’s joints and cartilage healthy and springy. Looking for more stuff like this? Here's a good article on feeding a Great Dane. We also wrote a detailed guide on food for labs. What is the Best Dog Food for English Setters?